SwiftKey, a keyboard app built for Android devices, has now launched a new version in the Google Play store, allowing users to resize and move their keyboards anywhere on a device, giving them the ability to type any way they want. 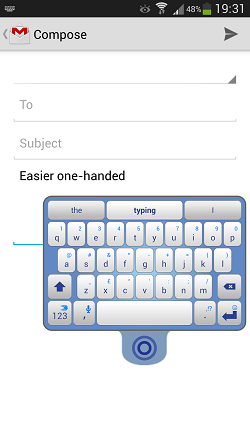 Branded as “Layouts for Living,” version 4.3 of SwiftKey has been in public beta mode since October. Now with a release date of Nov. 6, it’s geared towards users who seem to prefer bigger phones. As users begin opting for phones approaching tablet-like dimensions, or “phablets,” they can run the SwiftKey app across all Android devices, allowing them to share their preferences across these devices and change them, according to the size of device they’re using. SwiftKey 4.3 comes with three different modes, which is especially handy for users who have both phones and tablets and need to type in different ways, based on the screen sizes of their devices. One of these modes is the compact mode, useful for people using large phones. SwiftKey’s Layouts for Living minimizes the width of the keyboard, making it easier to type with one hand or with gestures. There’s also the full mode, which gives large-screen users the ability to use a full-width keyboard, plus the left-right cursor keys and a backspace key above the “Enter” key – mimicking the keyboard that users may use with their PCs. 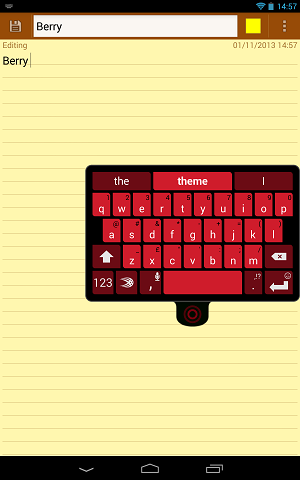 And then there’s the thumb version, which splits the keyboard into two pieces for users typing on tablets in landscape mode, or with wide phones in portrait mode. That makes it easier for them to type with both thumbs. “Layouts for Living makes it easier and more comfortable to type, whatever you’re using and whatever you’re doing,” said SwiftKey co-founder and CTO Ben Medlock in a statement. And for Canadian users, SwiftKey has provided a special twist with its latest update. While a lot of different keyboard apps allow for predictive typing, Canadian users get predictions based on local place names and personalities. For example, it recognizes “Stephen” in a Canadian context probably refers to our prime minister, rather than the author Stephen King. For people who are already running the SwiftKey app, they can update to 4.3 for free. New users can opt for a free trial via Google Play, the Amazon App Store, and Android PIT, with pricing for the app set at $3.99. Second 'Extreme Makeover' finalist: Kalaway Bay Resort Ltd.